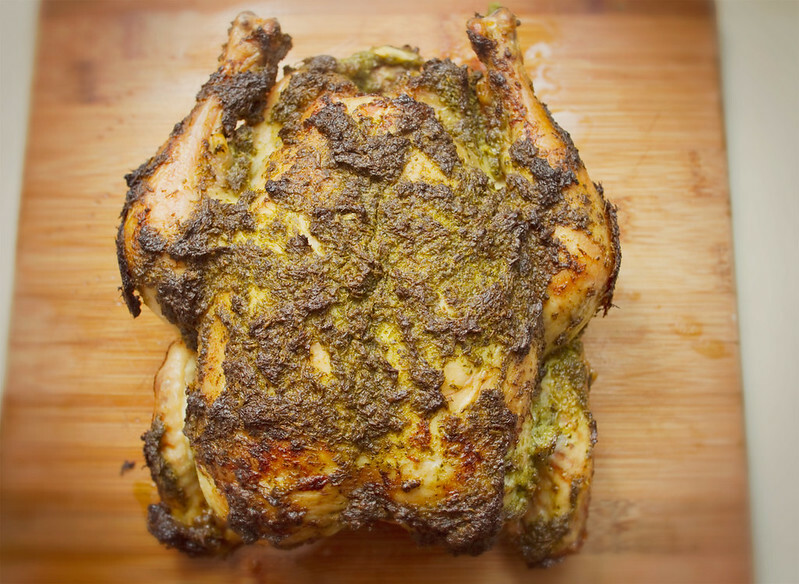 Little Market Kitchen: Sharp Scape Pesto, and Pesto Roasted Chicken. Sharp Scape Pesto, and Pesto Roasted Chicken. Pesto. It's so simple and so rewarding. Creamy, sharp, herby, and made without any heat- it's the perfect spring topping for all manner of dishes, from potatoes, to pasta, to chicken, to lentils (seriously, I had lentils and pesto today and it was awesome). Take a bunch of green things, some cheese, olive oil, lemon, maybe some nuts, and blitz it into a rustic puree. Usually when making pesto I don't use any measurements, but for the sake of this recipe, I measured as I went along. Basically, what I'm saying is you can feel free to play around with the measurements, as well as the ingredients listed. After all, this is a pesto yet it doesn't call for any basil, which is a staple of traditional pesto. So feel free to add or subtract green leafy things as you see fit. 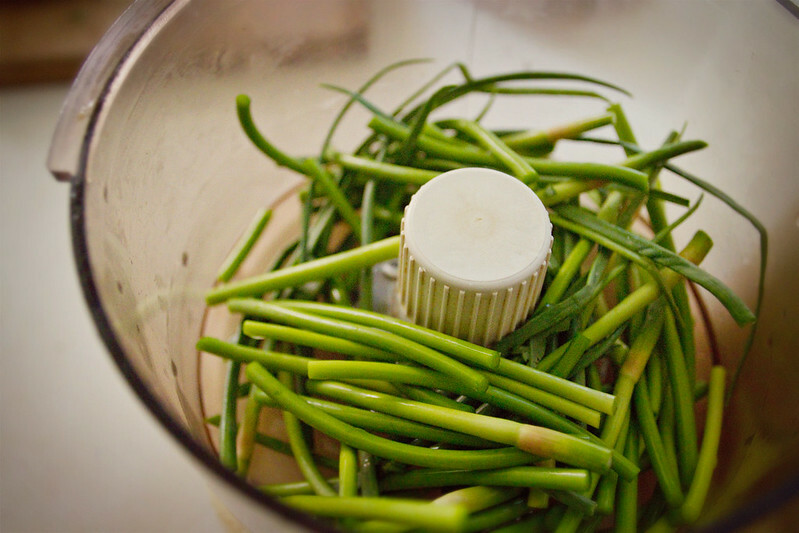 Garlic scapes- I could write odes, sonnets, whole novellas even, devoted to my love of the garlic scape. 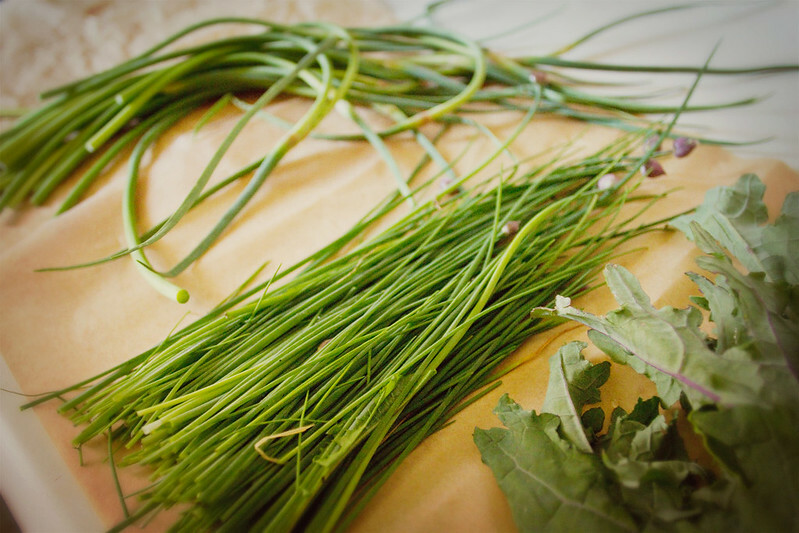 Scapes are the stalk of the garlic plant, the part which grows above ground. They're typically removed to encourage the plant to grow a large garlic bulb beneath ground, and are most commonly found at farmers markets and grocery stores from late spring through early summer, though here in nyc I can usually find them all summer. They're creamy and garlic-y but not overpowering. They make a lovely side dish roasted or sauteed on their own, but are also an incredible ingredient in dressings and soups, as well as in wilted vegetable salads. 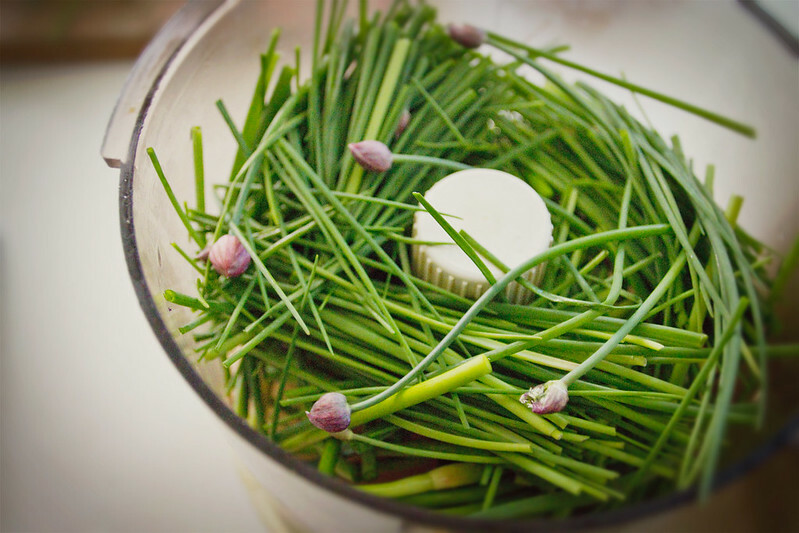 Onion chives are the smallest edible species of onion, and their little grassy blades topped with tiny purple flowers are delightful, like a springtime green tasting, not-too-strong onion, with a hint of garlic. Together with the gentler scapes and earthy kale, they make a sharp, flavorful pesto. And the hard cheese softens it all, just a bit. From this batch, I used a 1/2 cup for my chicken, and saved the rest (about another 10-12ozs) for meals later in the week. It was delicious on penne with some fresh grated romano cheese over top. I love roasted chicken. It's so simple and you can modify it so many ways. 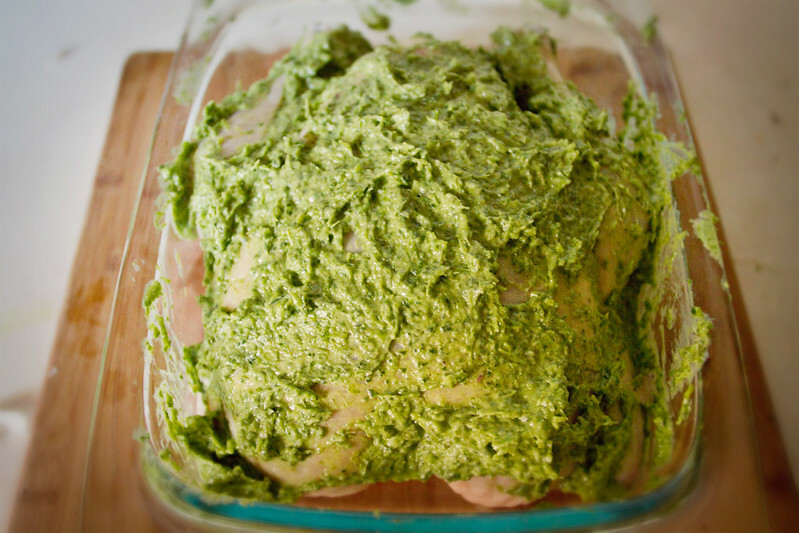 Garlic, beer, pesto, lemon-butter, most things taste good on roasted chicken. I've been kind of loving the way the inside of my oven photographs. Aside from the filthy bottom that is. 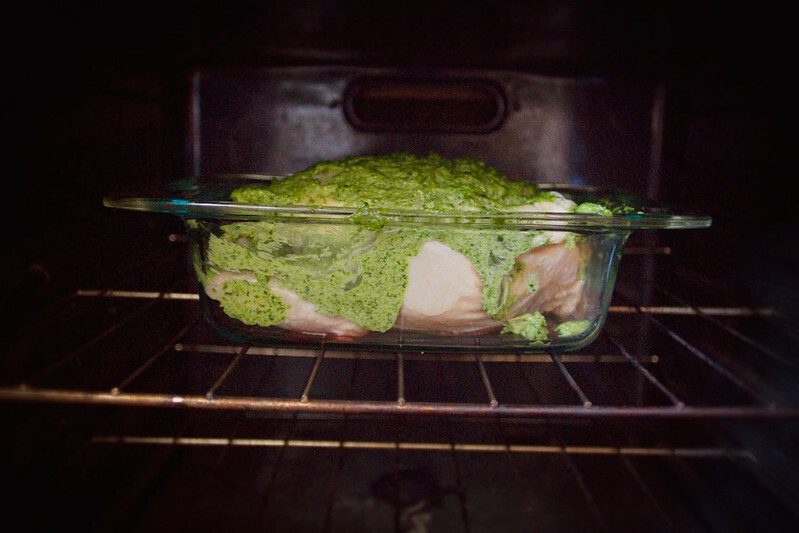 The pesto will brown up in the oven, but never fear, you've not burned it! That brown herby topping is delicious. 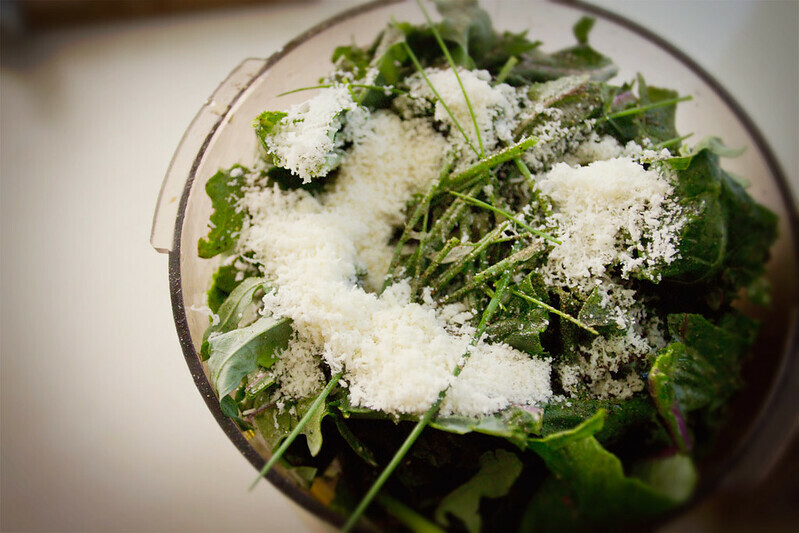 Use the food processor to grate your hard cheese- put it in as a block and blitz until grated. Wash all leafy greens. Chop the garlic scapes so they fit in the food processor, and add them, the onion chives, and the kale to the bowl of the food processor, squeeze the lemon over top, pour in the olive oil, and blitz. 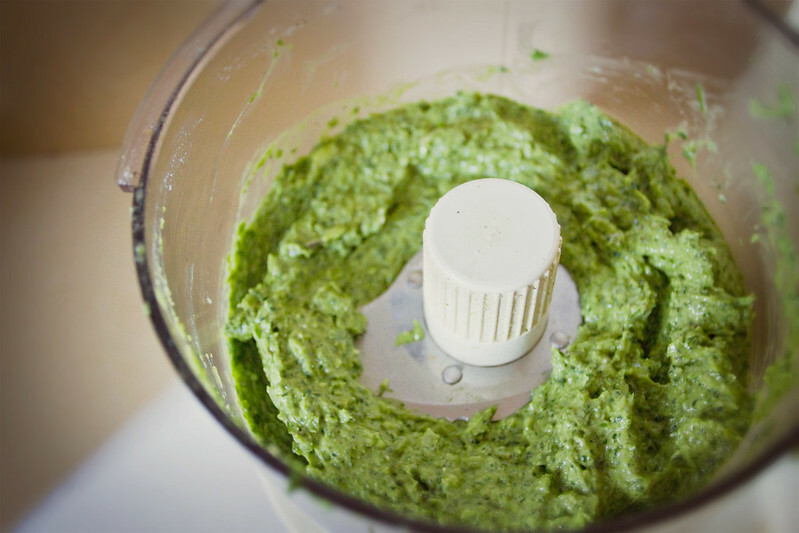 Run food processor (or blender, or vitamix) until the pesto reaches desired consistency. I like mine to be pretty smooth, but with some texture still, like a rustic paste. This takes my food processor about 3-4 minutes, but it's from the 1970's and only has one speed, so keep an eye on your pesto while it blitzes. When it's done food processing, pour into a jar, or directly on to pasta, smear it on bread, use it as pizza sauce, or make the pesto roasted chicken below. This pesto can probably last a week or so in the fridge- but we ate ours in two days flat, once on chicken and once on penne. Peel then crush the garlic cloves with the broad side of your knife, and stuff them in the cavity of your chicken. If you'd like to truss the chicken, go ahead and tie it up. I find the birds I buy at Whole Foods never need any trussing to keep the legs close. 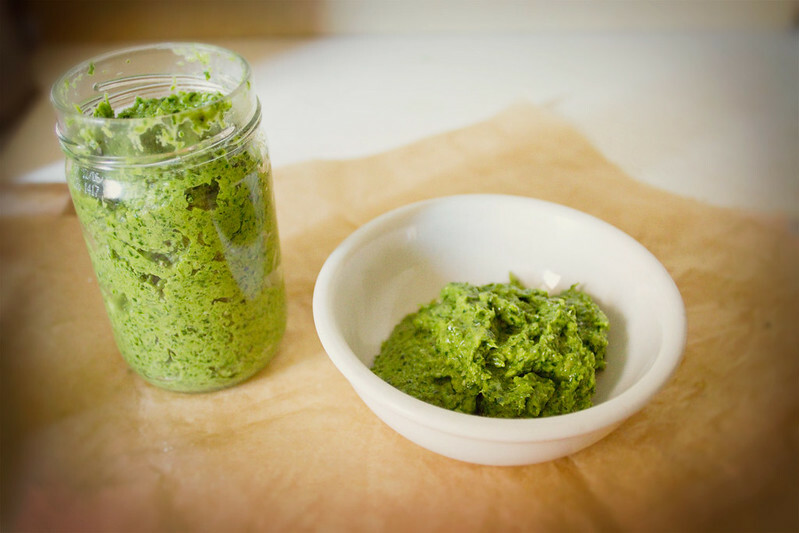 Combine the softened butter and the pesto in a bowl, mixing until the butter is thoroughly incorporated into your pesto. 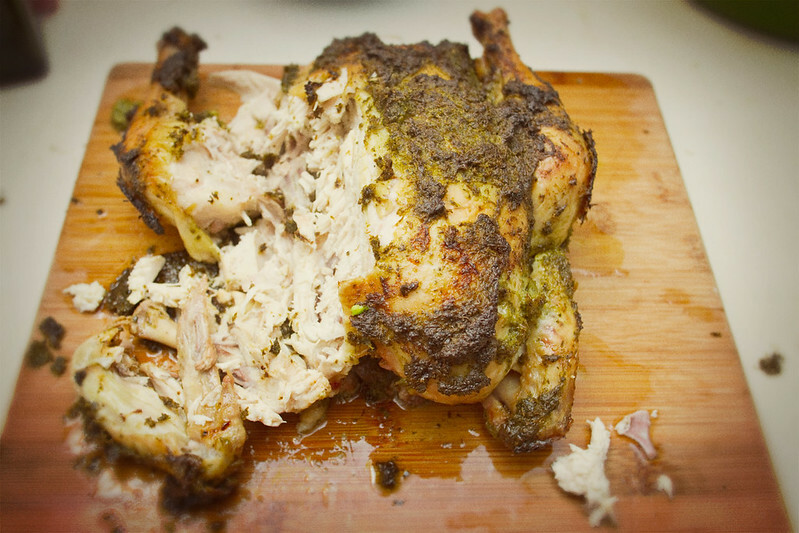 Place the chicken in a lightly buttered roasting pan, and rub all over with the pesto-butter mix. I gave mine a fairly heavy coating, using the whole bowl of pesto and butter, but how all out you go covering the bird is up to you. Feel free to go wild and really cover that bird. Add a sprinkling of salt and pepper over top. Place the roasting pan in the preheated oven, cook 20 minutes, then turn the oven down to 350 degrees fahrenheit and cook 20 minutes per pound, or until thermometer inserted into inner thigh reaches 165 degrees Fahrenheit. I don't have a meat thermometer, but the above method has never failed to produce a perfect chicken in my oven, even without checking the temperature. Remove chicken from oven and let sit a moment or two before carving. For the greens- any other leafy, flavorful green would probably work, certainly you could use basil, or replace the kale with arugula, or the scapes with regular garlic. Dandelion greens would probably make for a super-sharp and lovely pesto. Ramps would also work really well, greens and bulbs. For the cheese- I used Romano, but Asiago, Parm, Dry Jack, or any other hard cheese would work wonderfully. You could certainly substitute any pesto for the one I've listed above. Our chicken was ripped apart and devoured on the spot. I used the bones to make a fantastic batch of slightly-herby chicken stock in the slow cooker. Watermelon Salsa by the Sea.